When Do You Need a Water Softener System? Whether you're a beginning do-it-yourselfer, a seasoned pro at home improvement projects or looking for the vocabulary to discuss your renovations with your plumber, LoveToKnow Home Improvement's Plumbing section will give you the information you need to get the job done right. Fix a Leaking Shower Head - If your shower head is dripping, it may just be an easy fix. Check out this troubleshooting guide for this fix. Fixing a Leaking Tub Faucet - Drip, drip, drip... how to fix that drip? 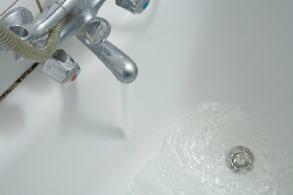 Before you call in a plumber, review this article to see if you can do it yourself. Replacing Shower Tub Faucet - One bathroom upgrade is installing a replacement shower tub faucet, but can you do the project yourself? Chances are, yes you can! From pictures and features of the top selling luxury toilets on the market to understanding how a sump pump works, get tips for your plumbing repairs, renovations and projects. More topics are addded continually, so check back often for the latest do it yourself plumbing projects you can tackle.